South Africa’s MultiChoice is stepping up its fight against DTT set-top boxes with built-in encryption by placing advertisements in Sunday newspapers. The advertsing is part of a dispute between e.tv – South Africa’s fifth terrestrial channel – and MultiChoice over whether free-to-air TV services should involve access control of the set-top boxes. In its ads, M-Net argues that DTT should be free of encryption because compulsory encryption would only mean added costs to both the consumer and the government, who is planning to subsidise the DTT receivers for is poorest citizens. 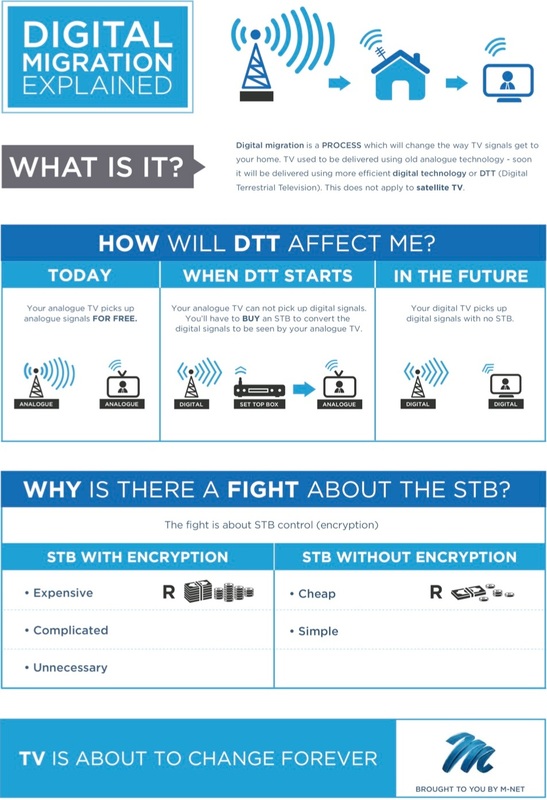 At the moment, the country’s STB specification, SANS 862:2012 (Edition 2), still requires that an encryption system be built into the decoders. MultiChoice (M-Net) is not happy, as this would effectively subsidise new entrants into the subscription-TV market, such as e-TV, which would compete with the broadcaster’s own pay-TV services.